The month of December can be stressful and crazy! We know the kids are ready for Christmas break, and honestly, so are we! I like to find ways to make the month of December special and memorable for my students. Here are a few ideas for celebrating Christmas in the classroom. I always come in during Thanksgiving break to set up my Christmas tree. Then, when my students come back to school, I invite them to bring or buy an ornament from home to put on our tree. I always ask that they don't bring anything that is glass or that they'd be heartbroken over if it was lost or came up missing. They always enjoy decorating our Christmas tree. Plus, I don't have to spend any class time making 36 of the same ornament. We also always visit two local nursing homes and sing Christmas Carols. This idea came to me after my first year in fifth grade. We take a half day D.A.R.E. field trip to tour our county jail. As you know, once you return from a half-day field trip, you might as well check out for the rest of the day. So, I thought it would be fun to make use of that time and go caroling. We don't use music or practice for hours on end. We don't have anyone doing solos. We just sing. We spend a few days memorizing the words and how we will stand. The residents at the nursing home always sing along and thoroughly love us being there. We also write Christmas cards and hand deliver them to the residents. I have my students write something basic, like "Hi! My name is Amanda. I'm a student at Crothersville Elementary. I hope you enjoyed our caroling today and that you have a very merry Christmas." Last year, we even had NINE residents write back to my students. They sent their letters or cards to the school with the student's first name on the outside. The school secretary brought them to us as they came in. It was such a great way for the kids to see just how much it meant to the residents. To bring in academics, we spend about a week working on planning what we would buy for our loved ones and how much that would cost. 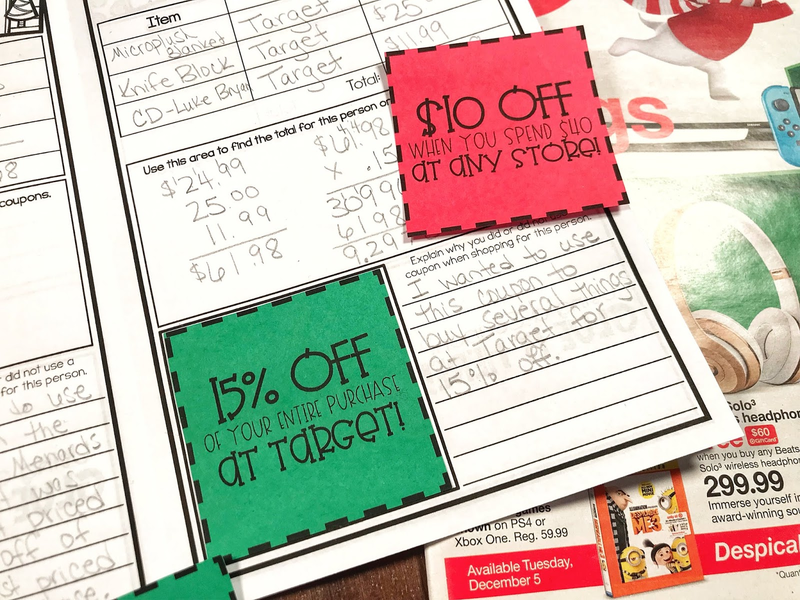 They utilize my coupons to help make the most of their budgets and use them strategically. It's a fun way to combat the craziness of pre-Christmas Break energy! You can find this in my TpT Store by clicking here. Do you know which is better for the environment? 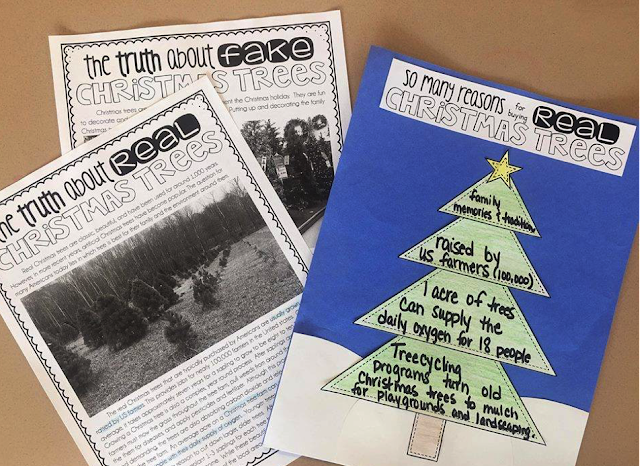 My kids and I always LOVE reading about the difference between buying a real tree every year and throwing it away or using a fake Christmas tree year after year. This is so engaging and perfect for practicing reading multiple texts, finding the main idea and details, comparing and contrasting, and writing a persuasive essay. My kids are always so engaged in conversation and sharing facts with others. I also have this in my TpT Store if you are interested. I also tell my students that they can wear their pajamas to school and to come ready for Christmas breakfast on the last day before Christmas break. I make a Cinnamon Roll French Toast Casserole and serve chocolate milk, white milk, orange juice, and fruit. It is such a great way to start the day. I usually ask for parents to donate the items needed. Before they come in for the day, I arrange my desks in two LOOOONG "tables" and cover them with butcher paper. I pull up Netflix and play the fireplace video. We have breakfast together by the fire. After breakfast, we spend time playing board games. I invite the kids to bring in games they like, and I bring a few from home as well. We just relax and enjoy our last day before break. I also love to do a sock gift exchange. By the time my kids have gotten to 5th grade, they've exchanged books, school supplies, games, and so much more! Girls buy socks for other girls and boys buy boy socks. We get into two circles, one for boys and one for girls. We play a game with dice, and it is SO much fun. I found it on Pinterest years ago and have used it for my students, staff Christmas parties, and family. You can find the printable here. 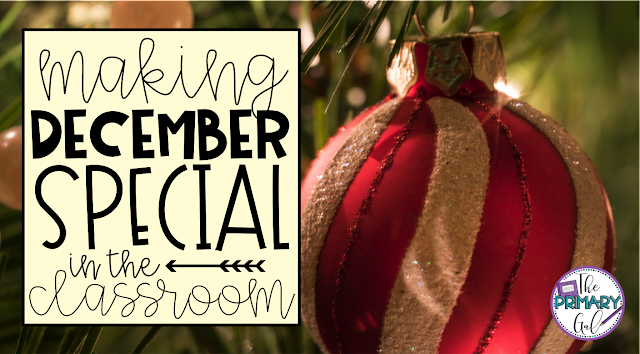 Making the month of December special in your classroom will be enjoyable for everyone using these ideas.